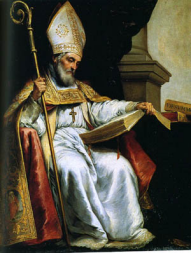 "Our society can well use Isidore's spirit of combining learning and holiness. Loving, understanding and knowledge can heal and bring a broken people back together. We are not barbarians like the invaders of Isidore's Spain. But people who are swamped by riches and overwhelmed by scientific and technological advances can lose much of their understanding love for one another. The 76 years of Isidore's life were a time of conflict and growth for the Church in Spain. The Visigoths had invaded the land a century and a half earlier, and shortly before Isidore's birth they set up their own capital. They were Arians—Christians who said Christ was not God. Thus Spain was split in two: One people (Catholic Romans) struggled with another (Arian Goths). Isidore reunited Spain, making it a center of culture and learning. The country served as a teacher and guide for other European countries whose culture was also threatened by barbarian invaders. Born in Cartagena of a family that included three other sibling saints (Leander, Fulgentius and Florentina), he was educated (severely) by his elder brother, whom he succeeded as bishop of Seville. An amazingly learned man, he was sometimes called "The Schoolmaster of the Middle Ages" because the encyclopedia he wrote was used as a textbook for nine centuries. He required seminaries to be built in every diocese, wrote a Rule for religious orders and founded schools that taught every branch of learning. Isidore wrote numerous books, including a dictionary, an encyclopedia, a history of Goths and a history of the world—beginning with creation! He completed the Mozarabic liturgy, which is still in use in Toledo, Spain. For all these reasons, Isidore has been suggested as patron of the Internet. Several others (including Anthony of Paduia) have also been suggested. He continued his austerities even as he approached 80. During the last six months of his life, he increased his charities so much that his house was crowded from morning till night with the poor of the countryside.